Originally I found the plans in a Patio design book from Home Depot. It is also available here from Sunset Magazine. The original publication in the book has a typo's and incorrectly drawn diagrams. The text in the online article is correct and should clarify any issues in the book. 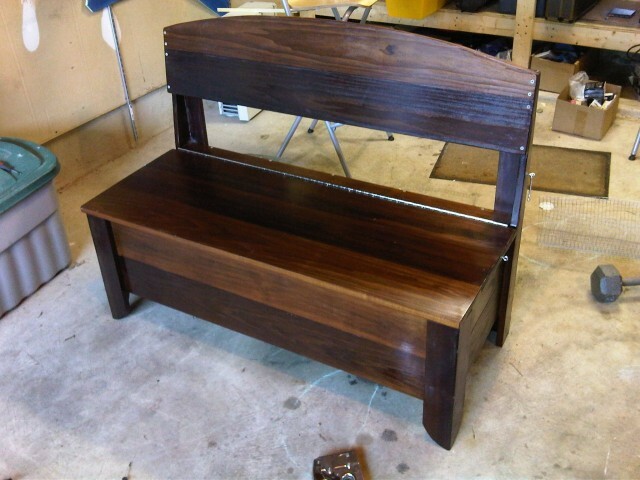 The recommended wood is ipe or someother tropical ironwood although cedar, redwood, or teak are also acceptible. The book warns against Pine and other similar woods because they are not strong enough. 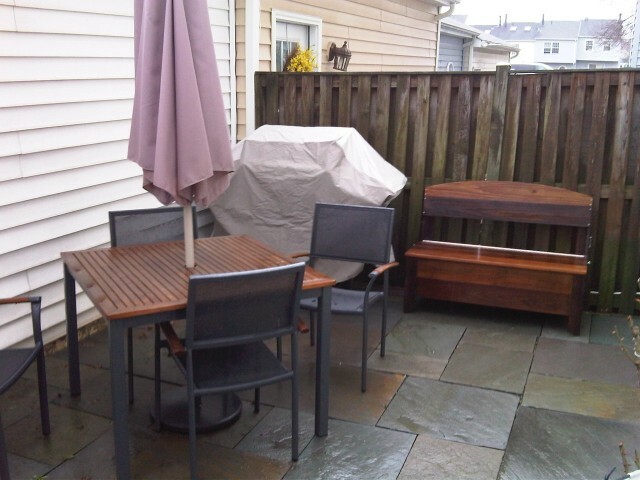 Originally I wanted to use teak so it would compliment my other patio furniture. The local lumberyard didn't have teak but it didn't really matter as I could not afford to pay $12/board-foot on a weekend project. 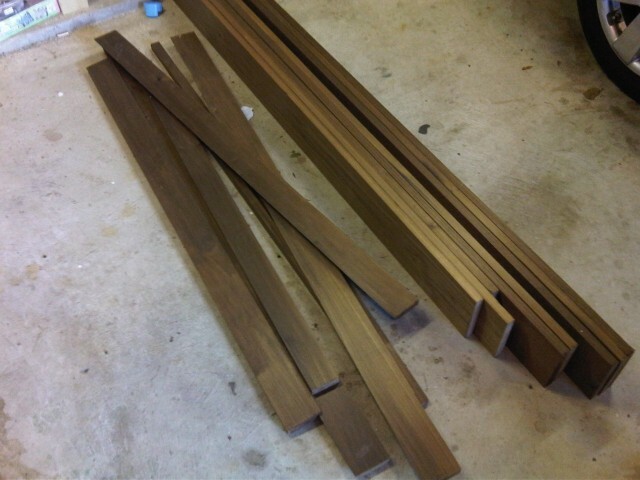 Instead the lumberyard guy recommended a wood called cambia, it was only $2/board-foot and had a nice dark color to it. Cambia is thermally-modified (i.e. 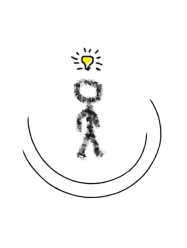 warmed-up) to make it more durable. According to the cambia website they thermally-modify many different species of wood (Ash, Birch, Poplar, and Red Oak). I'm not quite sure which one I have....but I'm guessing it's Birch. It has a tendency to split so you must pre-bore all of the holes. The plans assume you have 8 foot 1x6 lumber, so all of the cuts are made to work with this dimension. The boards I had varied in length betwen 9 and 11 feet, so I had to carefully utilize the various pieces. Most of the cuts are fairly straight-forward if you have a table-saw and jigsaw. 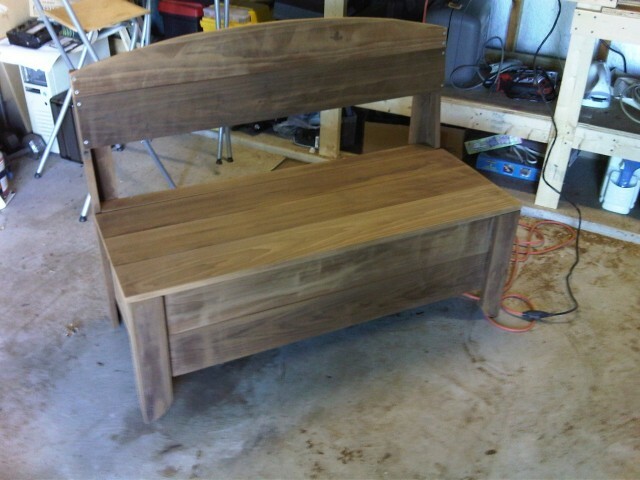 After cutting the wood the bench assembled easily, requiring about 2-days of work.